What Are Bad Scores for a Par-3 Golf Course? 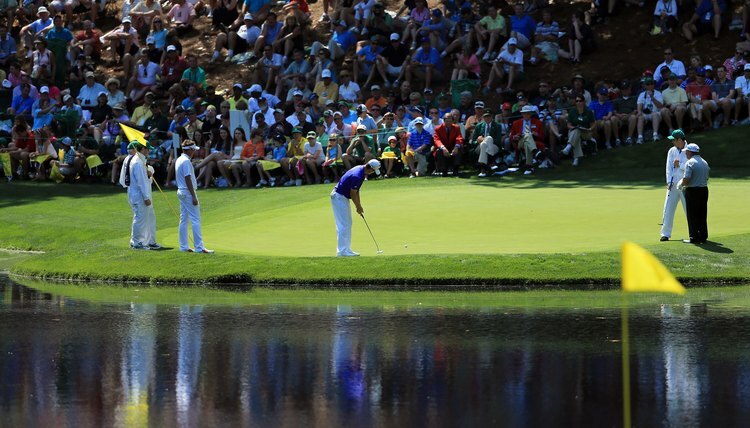 Justin Rose putts during the 2012 Masters Par 3 Contest. A standard 18-hole golf course typically features a par of 70 to 72, or about four strokes per hole. A par-3 course contains nine or 18 holes, most or all of which play to a par of 3. These novelty courses will never play host to an actual PGA Tour event -- although there is a par-3 contest prior to the Masters -- but the shorter courses can be fun and even challenging for golfers of all skill levels. Some shorter-than-regulation courses are referred to as par-3 courses even though they may contain an occasional par-4 hole. A pure par-3 course, however, features only par-3 holes. Few if any players will tee off with a driver, so the par-3 layout emphasizes putting and the short game. For example, the Los Feliz Municipal Golf Course in Los Angeles has nine par-3 holes ranging in length from 93 through 135 yards. Qualifying a specific score as good or bad on any course, including par-3 layouts, depends on the golfer’s ability and the course’s difficulty. As a general target, however, consider that a pure par-3 course plays to a nine-hole par of 27, or an 18-hole par of 54. For a scratch golfer, therefore, any score above par may be considered bad. For a bogey golfer, with a handicap of about 18, a score greater than 72 may be considered bad, depending on the course’s challenges. Just because a course is shorter than normal doesn’t mean it’s easy. The Threetops par-3 course in Gaylord, Michigan, for example, includes some tough bunkers and “dramatic elevation changes,” according to Golf.com, as well as a 219-yard hole. The Links at Terranea in Rancho Palos Verdes, California, includes a boomerang-shaped green. The greens at Magnolia Grove’s short course in Mobile, Alabama, slope severely. Angel Park in Las Vegas features an island green on its 12-hole par-3 course. The 169-yard ninth hole of the Blue Rock Golf Course in South Yarmouth, Massachusetts, requires the player to clear a water hazard. As of the date of publication, the best-known par-3 events of the 21st century have been the traditional pre-Masters event and the ESPN Par-3 Shootout. The latter event was played at the Threetops Resort from 1999 through 2006 and attracted players such as Phil Mickelson, Fred Couples, Jack Nicklaus and Lee Trevino. The Masters Par 3 Contest has been played since 1960 on a 1,060-yard par-27 course, with the current year’s Masters tournament players, past green jacket winners and other invited players competing. How Does Golf Index Translate to Handicap? What Is Considered a Low Golf Handicap? The Meaning of "Golf Handicap"
What Is a Handicap Index?